I don’t usually read biographies. I have nothing against them; it’s just that I’m never inspired to go that deeply into a life. But Vanity Fair ran a fascinating article abo ut the making of the film All the President’s Men. Tuned out it was an excerpt from the new Robert Redford biography by Michael Feeney Callan. I knew I had to read the whole thing. 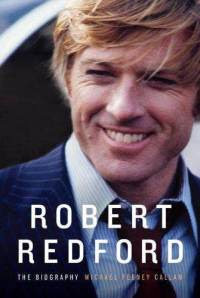 Robert Redford (Knopf) almost reads like a novel with a heavy focus on one character: a very handsome guy from L.A. who parlayed an eventful childhood surrounded by family and friends and Hollywood star drive-bys into one of the most successful careers in Hollywood itself. Actor, director, producer, and diehard supporter of independent film, Robert Redford is quite a guy. His life was never boring -- not to live, certainly, and not to read about. Callan has done exhaustive research, sanctioned by Redford, and Redford himself participated in the telling of his story. As did countless actors, directors, family members, and associates of all kinds. You’ll see his family criss-cross the country in search of home. You’ll see his brushes with fame and crime, his first loves, his earliest forays into acting, and his transition into directing. In some ways, Redford seems to have sort of stumbled his way through things, working for (and then getting) lucky breaks. A couple of things really come through. Redford is not the character many people think he is; that is, he is not Hubbell Gardener from The Way We Were. Everything did not come easily to him. What’s also clear is that Redford, while aware of his looks, didn’t coast on them. What’s somewhat more surprising is that Redford seems to have always had an instinct for character, story, and storytelling. His early work on stage and in film, the way he worked and argued with his directors about his characters’ finer points, proves he was well prepared when he took the helm directing Ordinary People, winning a Best Director Oscar his first time out. I was impressed with Redford time and time again. Callan paints the portrait of a man who saw the importance of his work, a man who fell in love with the west, a man dedicated to nature and the land, a man focused on being an actor rather than being a star, a man who understood that his own early frustrations making films could be channeled into helping other young filmmakers craft their own. I think if there’s one word that personifies Redford’s story, it’s “opportunity.” He was good at finding them, taking them, giving them -- and never abusing them.